In our time we think of literature as both experience and entertainment. In Petter Dass time there were completely different performances. Poetry was for help and education. The poet was the teacher and should convey a message. As a priest Petter Dass characterized the world of christianity. As a poet he belonged to the Baroque. Much of the Baroque poetry was characterized by a florid language with rhetorical effects. Petter Dass managed to balance this and created a simplicity of expression. This has undoubtedly contributed to the fact that his poems still lives while a lot of other Baroque literature has drowned in it´s own lavish means. 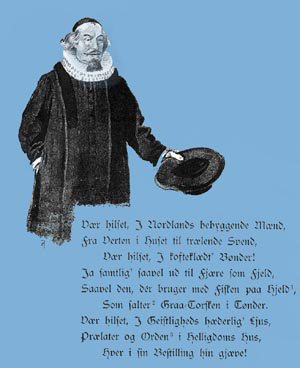 Petter Dass wrote poems and songs for all occasions. But first and foremost he wrote to guide young people and adults to a deeper understanding and respect for God’s creation and the Bible. Petter Dass released only one of his texts during his own lifetime. It is The Norwegian Dale-VII, 1683. His scriptures were scattered through a large number of transcriptions and by 1711 in numerous printed editions. The first edition of his collected works were published in 1874-1877.